Horn drenched R&B Soul you can dance to. Catchy hooks and great grooves. He is available for solo work, with a full horn section, and as an arranger. Steve never became a full fledged hoodlum, but sure stayed with his music! After obtaining a degree in musical education from the University of Lowell (now U-Mass Lowell) Steve embarked on a healthy musical career, playing with several area jazz & R&B ensembles, before finally helping to form the successful R&B horn band TORNADO ALLEY in the early 1980’s. 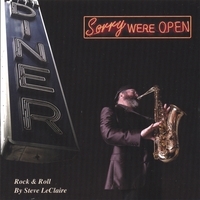 Steve & “The Alley Horns” toured throughout New England, sharing stages with the likes of Joe Cocker, Aerosmith, NRBQ, John Hall, Clarence Clemons, Richie Havens, The Stompers, The Joe Perry Project and many others. In between recording numerous jingles and performing as a side man, Steve also found time to lead his own 20 piece jazz orchestra (The Steve Leclaire Big Band) which performed in the central Mass area in the early 1990’s. During this period, he also performed blistering R&B with Rhode Island based bands “Pier Pressure” and “The Boys of Summer”. He hung up his horn in the mid 90’s for a few years to raise a family and invest time in his family’s insurance agency in Sutton MA, but never lost the hunger to play. Steve and his wife Joy have two children, Lauren & Ben and reside in rural Sutton, MA. Steve has jumped back into the music business head and heart first, and his current sound is better and stronger than ever. His new project and passion is a 10 piece Soul & R&B extravaganza called “The Valves” which features the original Tornado Alley Horns. The raw, edgy sound of his tenor sax wails above the band on rollicking R&B numbers, as well as crying out soulfully during slow blues. Today, Steve claims to have many influences. He credits Junior Walker, Clarence Clemmons, King Curtis, the Memphis Horns, David “fathead” Newman and Illinois Jaquet as players he enjoys. The records of the 60’s from Stax, Volt, Mowtown, Decca and the like all contribute to Steve’s musical psyche. He plays with a big sound from the heart. Steve is available for on call session work, arranging, and sideman performance. He is also available with the full compliment of “Tornado Alley Horns” for section work.